The patient below had 4,000 grafts FUE with Dr. Armani in Dubai for zones 1, 2 and 4. The goal here was to fill in the temples and to strengthen the hairline as well as behind the hairline in zone 2, and to fill in the entire crown area. The after photos are taken at 10 months. How old is he? looks like early 20ies. Eh, his hair looks thin in the before. » Eh, his hair looks thin in the before. It will look even thinner in photos to come,when all you got is the transplanted hair.Oh I forgot we might have HM by then,BIG MAYBE! The clinic should of turned him away,until he’s old and hairloss more stable. Its a bit extreme if you ask me!!! Thats a lot of grafts for a guy with no hairloss at all!!! A bit thin but thats it! Very stupid to perform a tranplant on this person; if he had one. Oh well, Armani got paid!! Excellent results very nice transformation from the before photo’s. Hair looks thicker and blends in perfectly with the new hair. Deffinetly looks younger with the harline and crown work. Awesome results man!! I had 4000 FUE’s as well with Dr. Armani. The hairline and the crown area look fantastic and completely natural. I know how life changing this procedure can be. Keep us posted with the growth. I had growth up to the 18 month mark. Let me know how you are progressing. Honestly, his hair loss is minimal, as I can tell from these pictures. 4000 grafts is ridiculous. And what I find even more astonishing is that representatives from Armani are parading these photos here as if something remarkable has been performed. » had growth up to the 18 month mark. Let me know how you are progressing. Yes and how about a photo in 10 years time.When you do not want to go out of house,because over the years the hair surrounding transplanted hair as fallen out,making it extremely obvious. » » how life changing this procedure can be. Keep us posted with the growth. » fallen out,making it extremely obvious. Relax. The good doctor’s working on an HM cure. Anyways… back to top… what’s this guys age? He is in his mid 30’s. He has had 3,000 grafts to restore zones 1 and 2 (the first 1/3 of his head) with grafts placed all in between his existing hairs. If his natural hairline continues to receede or thin he is fully covered in that area. He had 1,000 grafts for the crown. 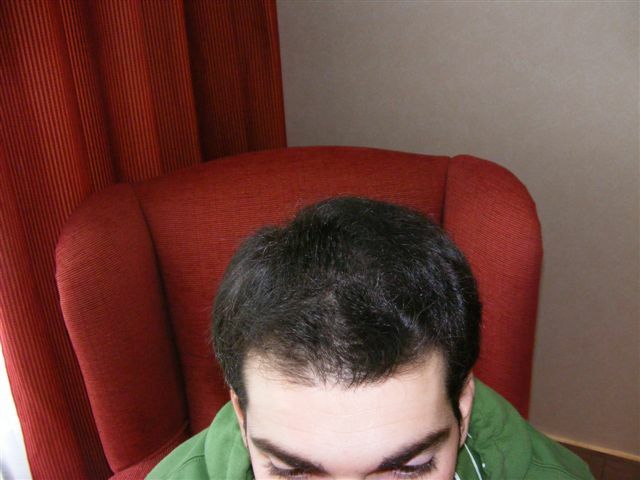 The patient’s hairloss has been stabalized with meds for the last 4-5 years where he was comfortable with addressing both the crown and the front. 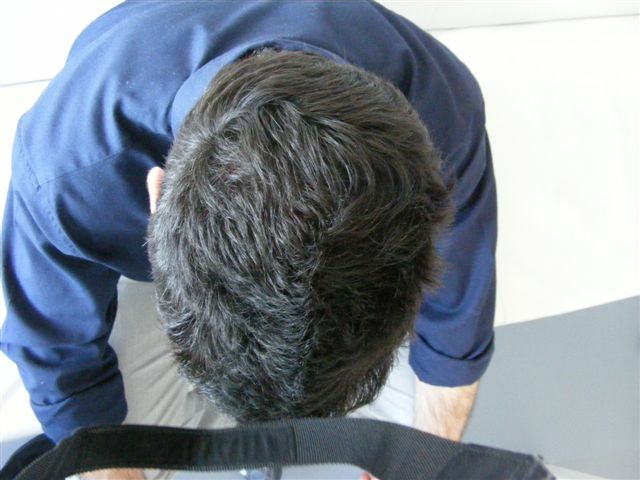 The patient is well aware that if his hairloss progresses he may need to come back for a 2nd procedure 5-10 years from now for zone 3 and to thicken the crown. He has plenty of grafts for such a procedure. Guys, the patient definitely did have high density, but he has used just 4,000 grafts to take care of the front and the back. Like Pats said, if he ever needed to thicken his hair in the middle or maybe even the crown he will definitely be covered. » In such cases, it is depending on the attitude of people, how to think about. As I am a perfectionist, I would agree to that guys, congratulating this patient to his great restoration. If you look objective to the before photos, you can see the deceeding or thinning hair in the frontline and also a problem in the crown area. O.K., this guy could also have been waiting for some years. But why should he wait, when he has recognized the problem yet. So I can say for my person, I am a perfectionist and also a guy, that is used to make up the mind. 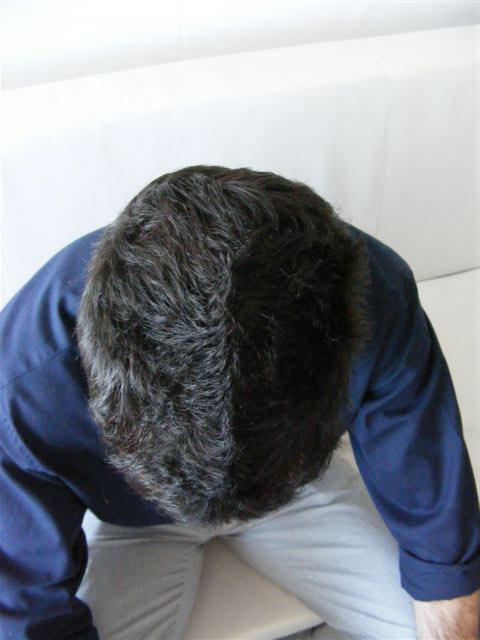 Now he has been able, to restore his dense and youthful hair with 4000 grafts. Should he wait until he needs 10000 graft like me. My problem was, that at that age this patient has, the transplantation of hairs were not so developed as it is now. So I wait and wait until 2004. But I have to go through many years of psychological discomfort, which now has ended with the restoration of my hair. Therefor, a second time: "Congratulations to this step in life and to the great results he has got!! As a recipient of a hair transplant myself I must say the decision to move forward with a procedure is a very important and life changing one. It’s not about what other people think in terms of needing a HT or not, in fact I had many friends and family tell me I did not need a HT. It’s totally about the individual and his/her goals and aspirations. I was thinning at a young age and did not want to “accept” the fact that I was losing my hair. With that said, there wasn’t a person in the world who could convince me not to have a procedure done. I achieved amazing results and can’t imagine what life would be like if I was still thin on top and had to deal with the insecurities I once had. 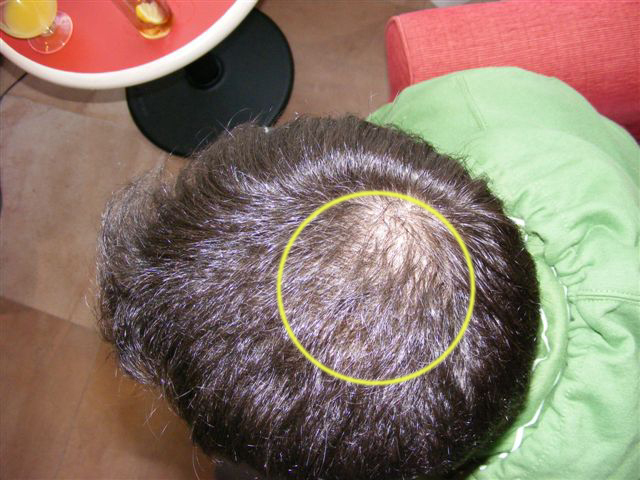 In this case, the patient was clearly experiencing hair loss and wanted to correct it before it got exponentially worse. His results are great and as Pats mentions, he has plenty of grafts remaining for future work if need be. » will definitely be covered. 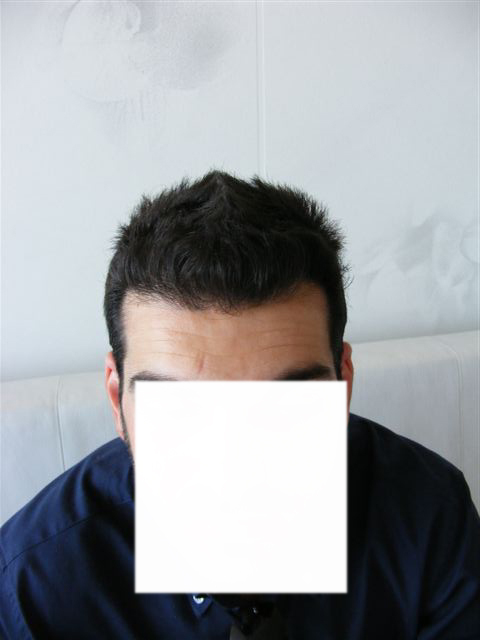 He didnt have any noticable hairloss, with a different style in the before pics noone would even guess that he is thinning!! !I bet if this guy in the before pics just had a shower and blow dried his hair noone would see nothing!!! I had an average donor area and I was able to get 7,700 grafts from FUE and I still have more grafts left for an additional procedure. Check out my blog if you would like to see pictures of my donor area. This guy has an excellent donor area. Dr Armani would have clearly told him the scenario of being committed to future procedures if his hairloss progressed, this he clearly explained to myself & my friend who have both have procedures with him. Overall I feel it is a very good result & one that I certainly would be very pleased with.